Our signature collection, creative director Lilly spent months working with weavers in the Outer Hebrides to develop this unique Harris design, specially for us. 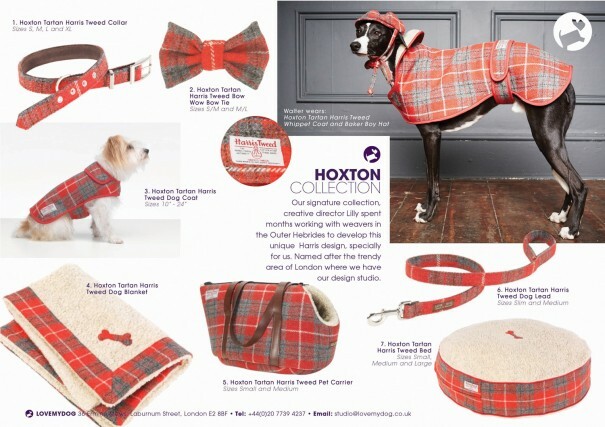 Named after the trendy area of London where we have our design studio, the Hoxton Tartan Harris Tweed Collection includes a dog collar, dog lead and dog coat, plus a dog bed, blanket and pet carrier. 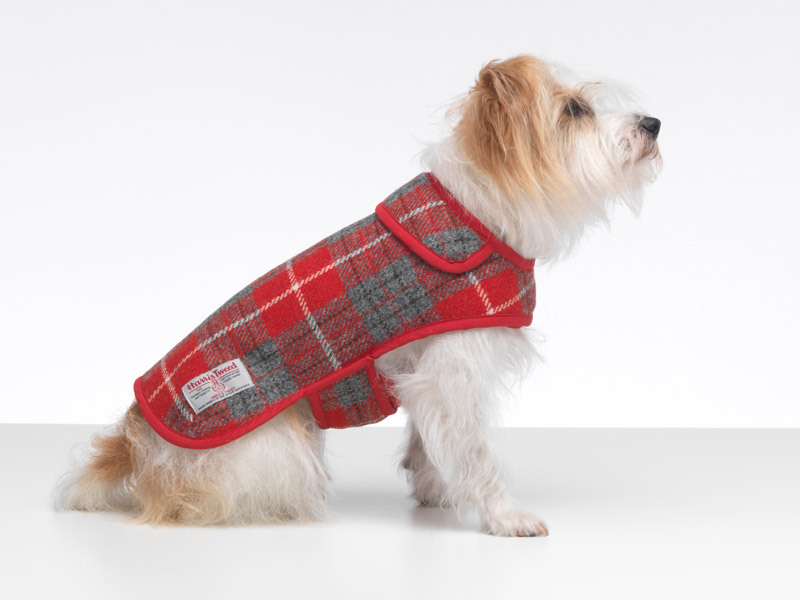 Your dog will be wearing a true piece of cutting edge British design when they step out in this Hoxton Tartan Harris Tweed Dog Coat. 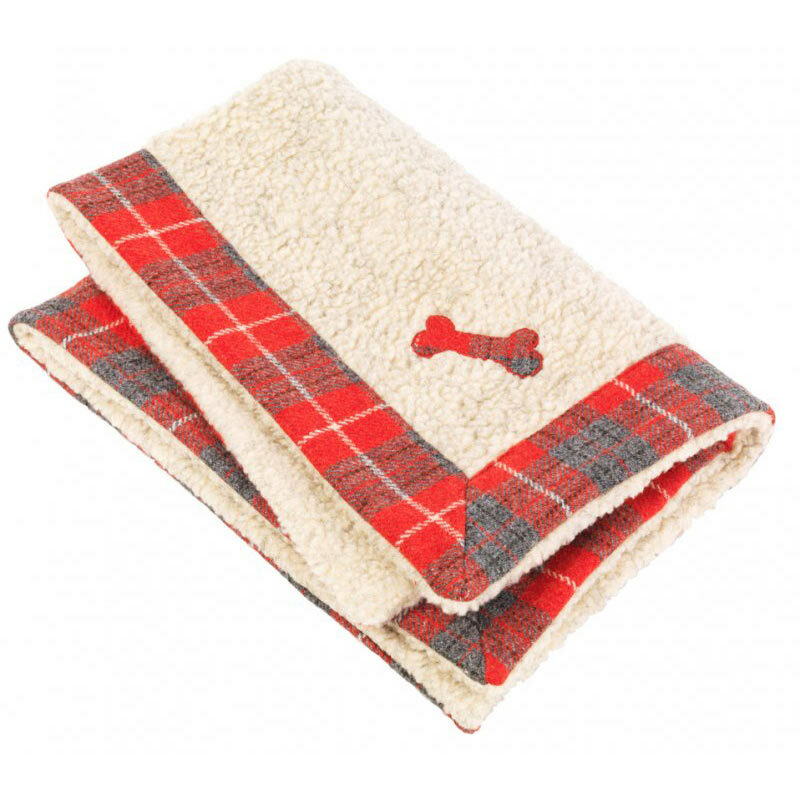 Beautifully made, it lasts a lifetime, feels wonderful and keeps your dog warm naturally. Soft padding gives this pet carrier a cosy snugness, and it’s also thermo-regulating to keep your dog cool in summer and warm in winter. It is light weight but extremely strong with long leather straps made from finest Italian leather. 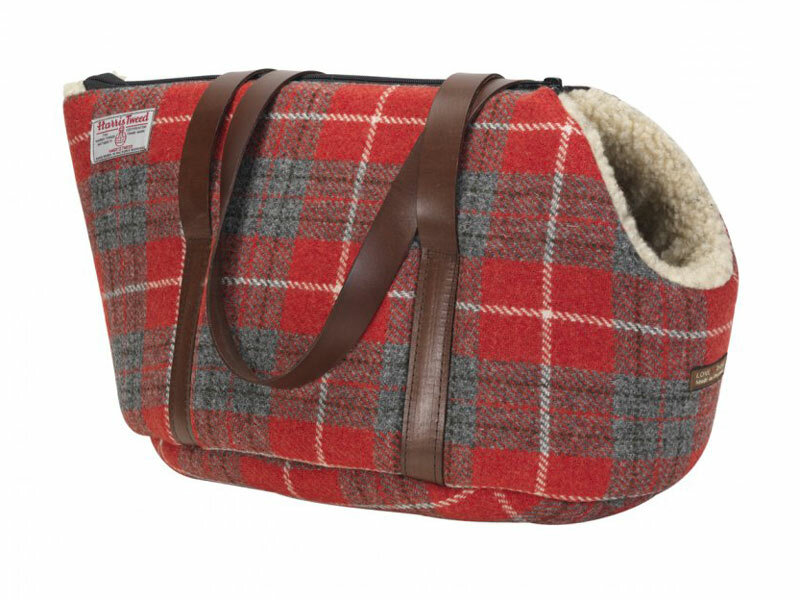 The Hoxton Tartan Harris Tweed Pet Carrier is available in a small size for toy and teacup breeds such as Chihuahuas and a Medium size for breeds such as Yorkies. For the ultimate in hand-crafted luxury, treat your dog to a designer dog bed in our signature Harris Tweed specially designed for LoveMyDog. 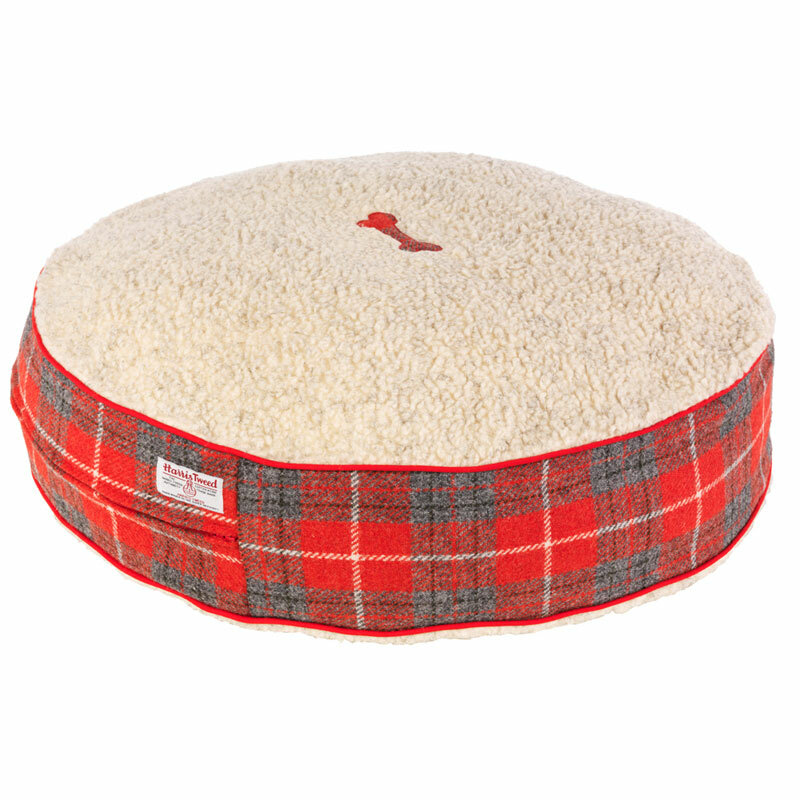 The Hoxton Tartan Harris Tweed Dog Bed has supersoft red tweed sides and a cosy, hardwearing Sherpa fleece top. We make the beds here in London, cutting and pinning the fabric and finally sewing on the appliqué details all by hand. We can add personal initials or symbols specially for your dog – just ask us when you order. 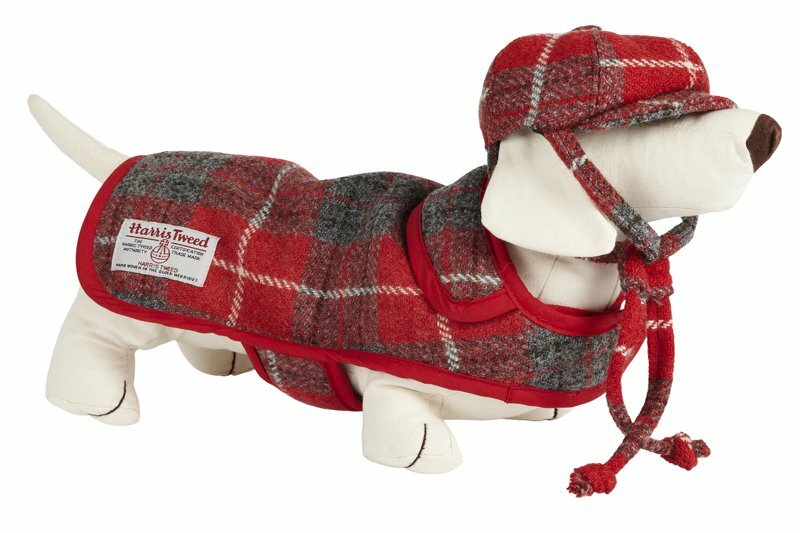 The Hoxton Tartan Harris Tweed Dog Blanket is made with thick, warm Sherpa fleece, which is so cosy and hardwearing. Dogs love snuggling into it or simply lying on it. If your dog’s blanket needs a clean just pop it in the machine on a delicate wool wash, and it comes up looking like new. Some dogs absolutely love wearing their hat – as if they know they’re the smartest canine in town. 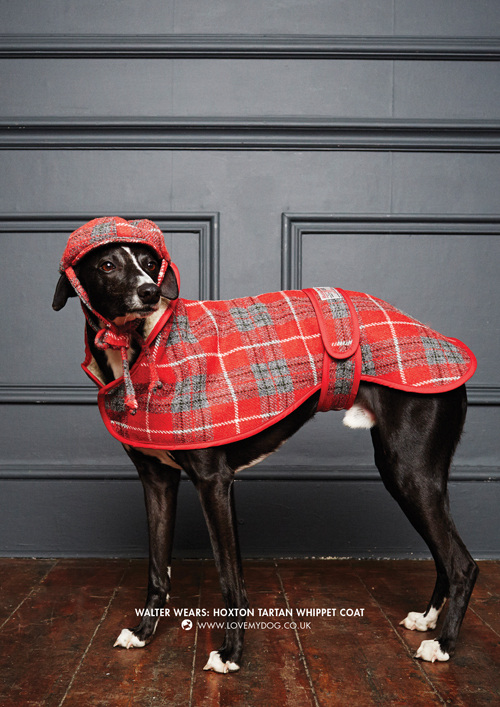 The Hoxton Tartan Harris Tweed Dog Hat really completes the outfit, and has a practical use too, as a hat can be very useful for keeping long dog ears out of the mud. You know what it’s like if it’s a Black Tie do and you have nothing to wear! 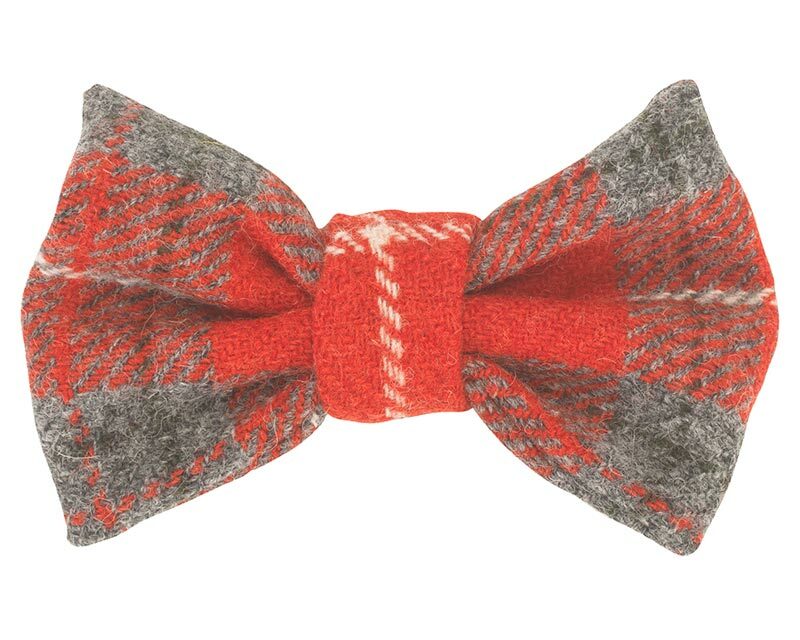 So why not add a touch of splendour to your dog’s outfit with a hand-made dog Hoxton Tartan Harris Tweed Bow Tie. Slip it on to your dog’s collar to cut a sartorial dash whenever the situation calls for it. 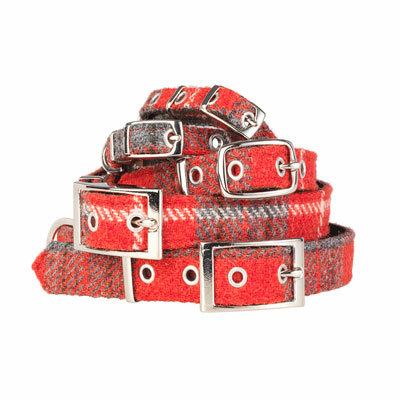 The metal buckles and eyelets are genuine saddlery fittings, so our Hoxton Tartan Harris Tweed Dog Collar feels substantial and well-made as you’d expect from a hand-finished couture product. After experimenting with a variety of different materials, we eventually found that dogs love the feel of suede on their fur. It’s soft and gentle to wear, doesn’t chafe or matt the fur and helps stop collar lines. and forms an excellent backing for the tweed. 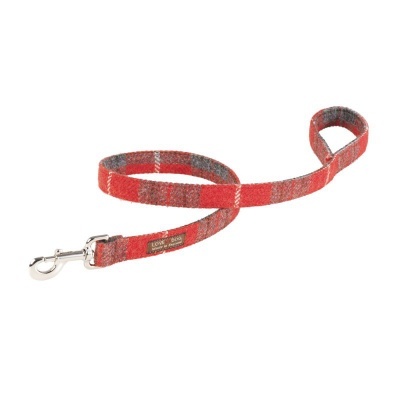 The sturdy metal clasp on this Hoxton Tartan Harris Tweed Dog Lead is similar to those used on the saddles of thoroughbred horses, giving the lead a wonderful quality feel to it (and lasting for years too). The Hoxton Tartan Dog Lead is approximately 1 metre long and is available in a slim width for small dogs or regular width for medium to large dogs. See the entire Hoxton Tartan Harris Tweed Collection here. Winston’s Visit To The LoveMyDog Studio! 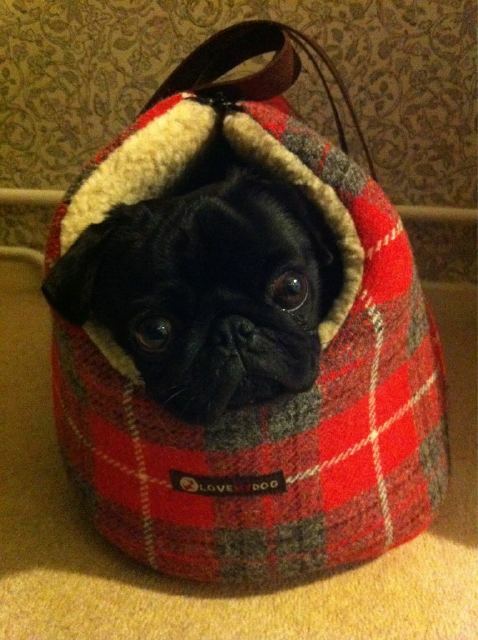 Winston the gorgeous black pug came in to the LoveMyDog studio and left with the Hoxton Tartan Harris Tweed Pet carrier. Winston has problems with his back legs and cant walk for long so he was snug as a bug in the carrier. He’d never been in a pet carrier before and just settled in straight away. Rabbit had a play with him and was very sad when he left! We love this picture that his owner sent us. The Hoxton Tartan Harris Tweed Pet Carrier is available online from 16th September.